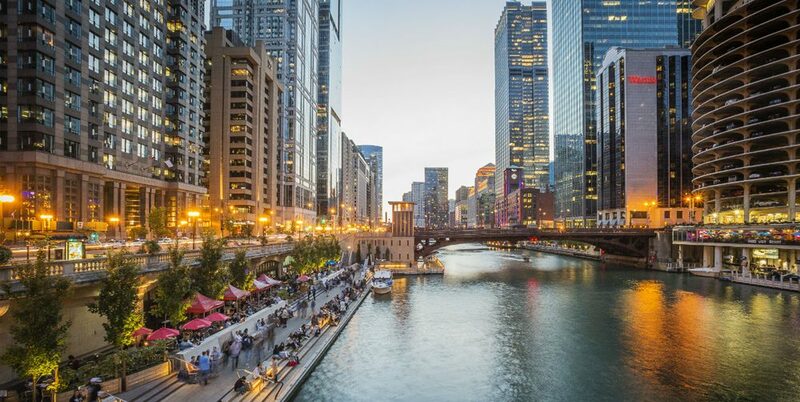 Now that the city is heating up (literally), it’s time to get outdoors and spend some time along the Chicago River for all its incredible attractions and beauty. While you’ll always find people strolling along the Riverwalk or taking in a chilly run in the wintertime, it’s really spring and summer when the Riverwalk is packed with action and people. What’s more, the construction along the Chicago River will be complete this coming summer, with new restaurants and bars opening up to further entice people to shell out a couple of hours to enjoy a full day in the sun. Wondering which activities to choose? Here are the top Chicago River attractions you’ll want to take in this season. The architecture tour cruise is a classic adventure for tourists and Chicagoans alike, as it offers pristine views of the city and its rich culture, and it’s super fun to take it all in along the water and in the sunshine. You can purchase tickets for a tour and then hop off and grab a bite to eat and a cocktail at one of the eateries along the river, such as Tiny Tapp & Café or City Winery. RPM Italian and RPM Steak are receiving a new addition, all of which are part of the Lettuce Entertain You restaurant group. RPM on the Water, which will sit right along the Chicago River and offer the same delectable service and food, will have four stories (wow! ), as well as open-air patios and waterfront views at basically every vantage point within the restaurant. It’ll also have a great event space for larger parties and weddings, if you’re looking to host something special this year. The river spans wide, so you can easily go for a 10-mile run or bike ride (or more!) along the river. It’s the perfect setting for staying active, as the views are spectacular and it’s a great way to embrace the city for all its beauty in the great outdoors. If you’re planning on running, you may want to go a bit earlier when hitting the Riverwalk before crowds of people show up, but beyond that, any hour will do just fine for a nice walk or picnic. Chicago has done a great job of highlighting local art along the Riverwalk, with permanent installations of public art in place. The art ranges—there are murals, sculptures, scriptures, and ceramic panels—so there’s plenty to see that’s all a bit different and original. Spend some time exploring beneath the Lake Shore Drive Bridge and between Columbus Drive and Lake Shore Drive, in particular. The Northman, a beer and cider garden, is spacious and ideal for large group settings or when you just want to stop in for a few beers or ciders and some Döner kabob sausages and pretzels. There are 24 taps of beer, wine, and cider and a great cocktail menu, as well. Plus, it’s dog and kid friendly, so feel free to bring that best bud and round of kiddos with you.